This luxury golf course lease is designed to lease an operating golf course back to its original owner following a sale of the land and improvements constituting the course to an investor in a sale leaseback transaction. The sale leaseback is essentially a finance transaction. This companion purchase agreement to this lease agreement is available as PA12453. This lease is a long term one, where the operating tenant pays rent, as well as all real estate taxes and utility charges during the term. The use permitted under the lease is, of course, the operation of the golf course, which must conform to a high level of quality as specified in the lease. 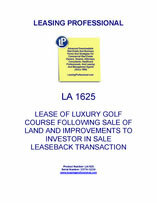 In addition, the lessee must prepare an annual plan to submit to the lessor for the lessor's approval, together with quarterly operating reports detailing income and expenses, the number of golf rounds played, including paid rounds by each guest or other category, expenditures made for capital improvements approved by lessor, the amount expended by lessee for the replacement of the golf course irrigation system and such other information as lessor may reasonably request. 1. Premises. Lessor does hereby demise and let unto Lessee, and Lessee does hereby lease and hire from Lessor, that certain real property more particularly described on Exhibit A attached hereto and incorporated herein by reference commonly known as the "_________ _________ Golf Course", together with all buildings and other improvements located thereon, and any rights, easements or appurtenances belonging to the same or held and enjoyed in connection therewith, subject, however, to the encumbrances set forth in said Exhibit A (hereinafter collectively called the "Premises" or the "Golf Course"). 2. Term. This Lease shall be for a term of two (2) years (the "Term") commencing on _______, 20__ (the "Commencement Date") and ending on ______, 20__ (the "Termination Date"), unless such term shall be sooner terminated as hereinafter provided. 3. Quiet Enjoyment. Upon payment by Lessee of the rent, additional payments and all other charges to be borne by Lessee as set forth in this Lease, and upon Lessee’s observance and performance of all of the terms, covenants and conditions hereinafter contained, Lessee shall peaceably and quietly enjoy the Premises for the term hereof without hindrance or interruption by Lessor or any other persons lawfully claiming by, through or under Lessor, except as expressly provided in this Lease. 4. Rent. Lessee shall pay to Lessor at its address set forth above in legal tender of the United States of America, without any deduction, notice or demand except as otherwise set forth herein, an annual net rent of ______________ DOLLARS (_________) in monthly installments of $_________ each payable in advance on the first (1st) day of each month during the Term prorated for partial months. If the monthly rent payment is not received prior to the tenth (10th) of any month, or any other charge or additional rent due hereunder shall not be received when due, then a late fee in the amount of five percent (5%) of the amount due which shall be due Lessor from Lessee within ten (10) days of written demand therefore. a. Real Property Taxes and Assessments. Lessee will pay directly to the taxing authority before delinquency, all real property taxes and assessments of every description assessed against the Premises that Lessor or Lessee in respect thereof may be assessed or become liable, whether assessed to or payable by Lessor or Lessee, during the term of this Lease, prorated for periods prior to the Commencement Date and as of the Termination Date. b. Utility Charges and Service. Lessee will pay, before delinquency, all charges for potable water, irrigation water, gas, sewer service, refuse collection, electricity, telephone, cable television, and other utility and similar charges arising from the use of the Premises. Lessee acknowledges that sewage treatment for the clubhouse is provided through a sewage treatment plant ("STP") located on a portion of the Premises and that Lessee shall be responsible for all costs of operating, maintaining and repairing the STP during the term of this Lease. Unless caused by the gross negligence or willful misconduct of Lessor, Lessor shall not be responsible for any interruption or failure in the supply of any utilities to the Premises. c. Tax on Lease Payments. In addition to the rents reserved above, Lessee shall pay to Lessor, as additional rent, together with each payment of rent or any other payment required hereunder which is subject to the State of _________ general excise tax on gross income, as it may be amended from time to time, or any successor or similar tax, an amount which, when added to such rental or other payment (currently _____% of each such payment), shall yield to the Lessor, after deduction of all such tax payable by Lessor with respect to all such rent and other payments, a net amount equal to that which Lessor would have realized from such payments had no such tax been imposed. e. Security Deposit. Lessee, contemporaneously with the execution of this Lease, has deposited with Lessor the sum of $________to be held by Lessor as security for the faithful performance by Lessee of all of the terms, covenants and conditions of this Lease by Lessee to be kept and performed during the term hereof. The security deposit may be commingled by Lessor with other funds of the Lessor and shall bear no interest. If, at any time during the term of this Lease, any of the rent herein reserved shall be overdue and unpaid beyond applicable cure periods, or any other sum payable by Lessee to Lessor hereunder shall be overdue and unpaid beyond applicable cure periods, then Lessor may, at the option of Lessor (but Lessor shall not be required to) appropriate and apply any portion of said deposit to the payment of any such overdue rent or other sum. In the event of the failure of Lessee to keep and perform any of the terms, covenants and conditions of this Lease to be kept and performed by Lessee beyond applicable cure periods, then at the option of Lessor said Lessor may appropriate and apply said entire deposit, or so much thereof as may be necessary, to compensate Lessor for all loss or damage sustained or suffered by Lessor due to such breach on the part of Lessee. Should the entire deposit, or any portion thereof, be appropriated and applied by Lessor for the payment of overdue rent or other sums due and payable to Lessor by Lessee hereunder, then Lessee shall, upon the written demand of Lessee’s, forthwith remit to Lessor a sufficient amount in cash to restore said security to the amount held by Lessor prior to such appropriation and application and Lessee’s failure to do so within ten (10) days after receipt of such demand shall constitute a default hereunder entitling Lessor to immediately invoke the remedies set forth in paragraph 35, including the termination of this Lease. Should Lessee comply with all of said terms, covenants and conditions and promptly pay all of the rentals herein provided for as the same fall due, and all other sums payable by Lessee to Lessor hereunder, the said deposit shall be returned in full to Lessee after Lessee shall have vacated the Premises at the end of the term of this Lease or upon the earlier termination of this Lease. In the event any bankruptcy, insolvency, reorganization or other creditor-debtor proceedings shall be instituted by or against Lessee, the security deposit shall be deemed to be applied first to payment of any rents and/or other charges due Lessor for all periods prior to the institution of such proceedings, and the balance, if any, of the security deposit may be retained by Lessor in partial liquidation of Lessor’s damages. Lessor may transfer and/or deliver the security, as such, to any purchaser of Lessor’s interest in the Premises and thereupon Lessor shall be discharged from any further liability in reference thereto. a. Premises in "As Is, Where Is" Condition. It is expressly understood and agreed that Lessor has not made any representation or warranty, express or implied, regarding any aspect of the Premises including, but not limited to, the implied warranties of merchantability, fitness for a particular purpose, suitability, habitability, quality, physical condition, value or profitability, and Lessor hereby disclaims any and all liability for any and all such representations and warranties. Lessee agrees that it has examined and investigated the Premises prior to the execution of this Lease and that Lessee has relied solely upon such examinations and investigations in leasing the Premises. Without limiting the generality of the foregoing, Lessee acknowledges that (x) it has made all inspections, investigations and analyses deemed necessary or appropriate to determine compliance by the Premises with all Hazardous Materials Laws that may apply to the Premises, and (y) Lessor has made no representation or warranty, express or implied, concerning the compliance of the Premises with Hazardous Materials Laws. Lessee acknowledges and agrees that it is leasing the Premises in its "as is, where is" condition, with all faults, if any, and subject to termination rights described herein, that Lessee has assumed all risks regarding all aspects of the Premises, and the condition thereof, including, without limitation: (i) the risk of any physical condition affecting the Premises including, without limitation, the existence of any Hazardous Materials, the existence of any soils conditions, or the existence of archeological or historical conditions on the Premises; (ii) the risk of any damage or loss to the Premises caused by any means including, without limitations, tsunami, flood, earthquake or volcanic eruption; and (iii) the risk of use, zoning, habitability, merchantability or quality of the Premises or the suitability of the Premises for its use. Except as otherwise described herein, Lessee expressly releases Lessor from any and all liability and claims that it may have against Lessor, its successors and assigns with regard to Hazardous Materials presently existing or hereafter placed on the Premises, and Lessee hereby agrees to indemnify, defend and hold Lessor harmless from and against any and all claims and demands for loss or damage, including claims for personal injury, property damage or wrongful death, arising out of or in connection with a release by Lessee during the Term of Hazardous Materials in violation of Hazardous Materials Laws (collectively, "Lessee Hazmat Liability"). Lessee shall not be responsible for any Hazardous Materials released in, on, under and about the Premises by Lessor (collectively "Lessor Hazmat Liability"). Lessor shall be and remain liable for all, Lessor Hazmat Liability, on, under or about the Premises, and for all clean-up and remediation thereof. Lessor shall and does hereby indemnify, defend and hold harmless Lessee and Lessee’s members, officers, directors, agents, employees and invitees from and against any and all claims, lawsuits, liabilities, costs, fees (including reasonable attorney’s fees) and expenses of every kind and nature relating to or rising from a Lessor Hazmat Liability. The provisions of this paragraph 7 shall survive the termination of this Lease. b. Adjacent and Nearby Property Uses. Lessee, for itself and any person or entity claiming by, through or under it, understands and acknowledges that the Premises are adjacent to or nearby lands used for the operation of a pineapple _________ and other agriculture related activities and such other uses as may be permitted by law on said lands, and that Lessee desired and sought the Premises with the understanding that the Premises may be affected by nuisance or hazards to persons and property from such operations and related activities. Lessee covenants and agrees for itself, its permitted assigns, transferees, and any other party claiming by, through or under it that it assumes all such risks associated with such location and that it shall defend and hold Lessor harmless from any liability, claims or expenses, including attorneys’ fees, property damage, personal injury, or wrongful death arising from such operations and activities, and further covenants and agrees that the owners and occupants of such lands shall have the right, in the nature of an easement, to perpetually discharge, emit, diffuse, and inflict over and upon the Premises noise, smoke, soot, dust, lights, noxious vapors, odors, and other nuisances of every description arising from or incidental to the operation of the foregoing and other activities, subject only to zoning and other legal restrictions on use.